Searching Google, Blogger, and Technorati for something like 20 minutes indicates that this site is possibly the first real estate blog to cover Greater Asheville and North to the Wolf Laurel area in Madison County. 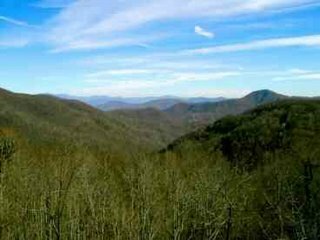 This is the high country that impressively rises as one heads north from Asheville, a mere 25 miles or so, toward the TN border and reaches elevations above 6,000 feet. The photos in this post are from the back porch of The Wolf Laurel Country Club. The one above shows Big Bald Mountain in winter, (elevation 5,512 feet), while the photo below looks NW towards The Black Mountains of Mitchell County. These are the highest mountains in the USA, east of The Missisippi River. The Wolf Laurel course is said to be the highest golf course in the eastern US, and the scenery in the photos is typical of what one sees when living, working, relaxing or recreating in this part of the world. Pretty impressive stuff. My intentions for this blog are to first be a source of insights for people interested in what it is like to live here. Readers should therefore plan to see a softness on the sales side of the equation. 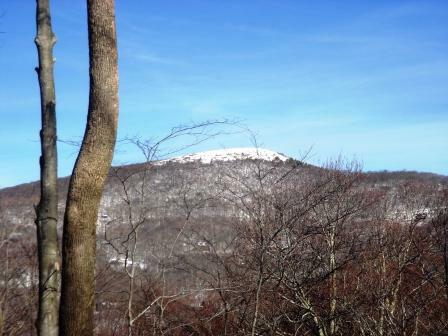 What you will find instead wlll range from local arts and cultural happenings, to local government and political issues, to hard analysis and data on Western North Carolina's Mountain real estate markets. How else can one really make an informed decision on their next real estate purchase? In short, what I hope you find here is the kind of information that goes beyond soliciting your business, but instead is a slice of life in the mountains and solid information on locaI markets, without sales pressure. I believe these mountains to be one of the premier areas of the country for quality of life. I hope you find what you're looking for in making your decision, I will be glad to assist, and good luck. Thanks for stopping by, feel free to visit The Black Bear Realty Home Page.